this is the black external antenna with higher gain. I really suggest this vs the pcb antenna. I've successfully used a 700 mA one. I didn't measure power consumption, but I think this is a good reference minimum value. I always wanted to build a wireless security camera with full control on its programmability / features and the possibility to hide it inside a very small, anonymous box. Few weeks ago I started building it using the Arietta G25 board.The base elements of the project came from a sample application to stream video. I've built on top of that example using a specific HW configuration and different SW. Please note: this is my first project publishing and I hopefully wrote enough detail. Also, it is the first delivery and I will later update it with some access control details and IoT integration steps. Please read it once before starting so that you are aware of the small issues and workarounds that I've found. I will list first the HW instructions to assemble the device and then move to the SW configuration. The board is based on a ARM 9 (Atmel AT91SAM9G25) at 400 MHz with 256MB of RAM and microSD for the OS (see picture below). You can add a WiFi module just on top to add network connectivity. It runs Debian Linux and has a good number of I/O ports. I've used a Microsoft Lifecam webcam but you can use any USB based webcam that has drivers on Linux distributions and is compatible with Motion. See the HW section for the components list. 1 / 2 • This is the board without the WiFi module. You can purchase both asking to have it already soldered for you. You start by unscrewing the two small screws on the back of the camera to get rid of the front side. It has a small plastic clip but it will come away easily with the help of a small screwdriver. You will notice that there are two black wires soldered to the cable shield. One is for the metal shield for the microphone: you can cut it away. A second one is connected to the board on the pin marked C in this picture. Apparently, it is not needed by the webcam, so I just unsoldered that (you can just cut it away if you prefer). Ever since I've cut the wires so short inside the case, I took a longer piece of shielded cable from the original USB cable and replaced the wires on the board one by one, soldering them to the corresponding pinout. Be patient and use a small soldering tip here. There was also a small piece of scotch tape around the sensor: I actually removed that, but I think I will place something similar again when mounting the whole device in the final box. In order to connect, work and debug in a easier way I decided to use a serial debug cable. The Arietta has 6 pins available for a serial debug port and ACME Systems sells a complete debug port adapter. Ever since I already had a USB to TTL cable adapter with proper chip and voltage levels that I used for the Raspberry PI, I decided to reuse that soldering a 4 pins male header to the board. It is really useful since you can follow the whole Linux boot sequence and also connect and work using a simple terminal client like Putty. depending on the microSD size you've chosen, follow the instructions to extend the partition and be able to leverage the space (I already had a 16 GB one so...). In the forums I've read suggestions to use fast and quality microSDs. I had a class 10 by Samsung and it worked very well. This means that if one wants to use the webcam at full resolution (1280x720 in this case), he will need to use port A with this configuration that includes the WiFi module. Fortunately this conflict can be solved. In order to use port A, we will need to avoid using the g_ether driver that is configured by default to get network connection via the microUSB connector. You will see how in the steps below. Arietta, just like the Arduino is accessible and programmable using a micro USB connector. 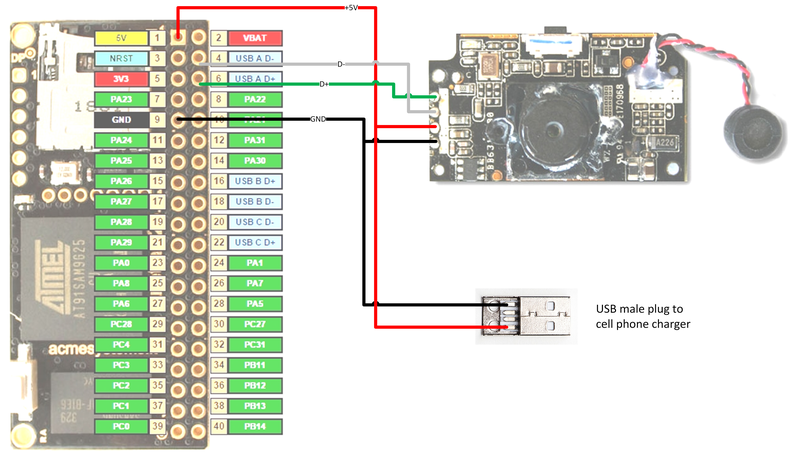 Since we will disable the config to use the microUSB for networking, I strongly suggest to start and continue using the USB to TTL debug cable, connected as described in the HW steps, for the first 4 steps at least. On this page http://www.acmesystems.it/tutorials you will find several ways to connect to the Arietta depending on your OS and the preferred channel (serial or network). Please refer to the links in this page for the suggested SW and methods. Plug the USB to TTL debug cable in a usb port of your laptop/PC a driver should be activated automatically. Here I've found an issue: I'm using Windows 8.1 and the "Prolific" driver for my R-PI USB to TTL debug cable seems to be no longer supported. I tried some workarounds but with no success unfortunately. I also have an Ubuntu Virtual Machine running on VirtualBox, so I've run that VM and enabled the Ubuntu driver for the USB to TTL cable from the VirtualBox VM menu . This one worked immediately. where /dev/ttyUSB0 is the device id assigned to the debug cable by default. You will notice that a small red LED will start blinking on the Arietta board and you will see lots of Linux messages, boot related, appearing in the terminal connection window on your laptop. Wait for the boot sequence to complete. A login prompt will appear. You are now connected as the root user, so you will have all the permissions needed to perform the next steps. You will also have the permissions to create issues :-) so be careful. I've published on github a set of configuration files copied from my Arietta. I kept the same folder structure so you will know where they have to be copied, replacing the existing ones. Download the zip file on you drive and open it to your preferred folder. You will notice a block of lines commented out with asterisks. I did this in order to disable usage of network through the microUSB port. This way the g_ether driver will not use the USB port A that we want free for the webcam. Now you will have to customize some of the parameters in order to connect to your WiFi. Ever since most of the home networks should have at least wpa security enabled, I've copied the configuration for my one, changing my real security and config details (IPs, wpa-ssid and wpa-psk). I wanted to have a static address assigned to this device. I've chosen 192.168.0.24 (within my network address range) and specified this and my network gateway 192.168.0.1 in the file. You can/should customize these for your network and preferences. Save the file on your laptop for backup and reference. Then select and copy its whole content to the clipboard. the editor window will open, hit F9 (delete line) until you have deleted all the file content. At this point you can power-off the Arietta. Wait few seconds and then power-up again. The Arietta has a small web server (lighttpd) installed to allow first check of setup and to give access to the Codiad web based IDE and Shellinabox (a web based terminal emulator). From now on, you have various connection options to work on the Arietta: keep using the debug cable+terminal session OR connect via network to the configured IP address using the PuTTY client on windows OR using the web based Linux shell. and enter the acmesystems password when requested. During my first tests I realized that, should the power go away you would lose the correct date/time unless you add a backup battery. I didn't want to add a battery to this project since I want to keep it small. It's important to get the video frames stamped with correct date/time and also to have Motion creating the video folders with correct/current date. In a later step we will customize a bit the NTP configuration. Motion will store images and videos in sub-folders named with the current date. During my tests I've seen that Motion was still creating some folders with OLD/WRONG dates. - in that script: check for internet connection availability in a loop for up to 25 times, if internet is available then set the date/time directly with the NTPDATE command and then launch Motion. Please note that, if no internet is available, then the script will launch Motion anyway so that you get it running and taking pictures (this has still some priority). That script is ready for you between the files I placed on github. We will copy them at a later stage. Please note that there could be other better approaches to solve this, but I did not get working suggestions during that time frame. If anyone has good advice about configuring a boot sequence... it's very welcome. WinSCP is free utility to explore a remote Linux file systems using the SCP protocol. The program is very easy to use and is based on two windows placed side by side, representing your laptop file system and the Arietta file system. You can easily copy files from one side to the other and create/delete/rename files and folders. Please note that the the folder names are case sensitive, so do not change them. After creating the folder, I've setup its permissions like you see in the following screenshot. You can open this Properties window using the right mouse button on the newly created folder. I will probably review the permissions at a later stage. and ensure you specify your preferred time server in place of the current one ( ntp1.inrim.it ). I've selected that one because is the official Italian one. You can search on the web for your one and use its name here. do the same change also in this file from ntp1.inrim.it to your preferred server name. Reboot again your Arietta powering off and on after some seconds. Follow the boot sequence on the debug port Terminal session. The webcam board blue LED will stay on signalling that Motion is using the webcam. At this point the Arietta will offer you two web interfaces interfaces, see screenshots below. To see the video and images captured by Motion, open your browser at http://yourAriettaIPaddress/motion this will show you a web folder with links to folders (one per day) and some .avi files (one per movement event detected by Motion). Inside the daily folders you will see images related to movement detection events plus an .mpeg video condensing all the event frames for the whole day (sort of time lapse video). It is also possible to watch video frames flowing through Motion during its processing. You can open the stream using for example VLC or similar video player. Please note that the framerate is low since Motion is using 1-2 frames per second to perform its processing and detect movement in the scene monitored by the webcam. I think I wrote a lot, probably too much, Please let me know your feedbacks, really appreciated. I already have a to-do list here for the next steps. If you use these build notes and find issues, errors or missing info just let me know and I will be happy to do my best to support.